Firefighters are battling to save multimillion-dollar homes in the path of the flames while trying to evacuate residents. The Getty Center and nearby Skirball Center, both on the west side of the 405 freeway opposite the blaze, did not appear to be threatened. Both facilities were closed for the day and were to remain closed Thursday, FOX11 reported. Santa Monica College and all schools in the Santa Monica-Malibu school district were also closed Thursday, according to FOX11. In addition to 40 charter schools, 52 schools in the Los Angeles Unified School District were closed citywide in response to the Skirball Fire and other blazes, district officials said. Officials warned the color-coded system showing the expected strength of the Santa-Ana winds on Thursday driving the region's fierce wildfires had reached uncharted territory, pushing past red -- which means "high" -- into the color purple, meaning "extreme." "We're talking winds that can be 80 miles an hour," Pimlott said. "These will be winds that there will no ability to fight fires." Those fierce winds can instantly turn a tiny fire into a large one, or carry embers that spark new fires miles away. Millions of cellphones buzzed loudly Tuesday night from San Diego to Santa Barbara with a sound that usually means an Amber Alert; but this time the noise signaled a rare weather warning for strong winds. Officials hope the electronic push will keep the whole region alert and keep the death toll from the week's fires at zero. Melissa Rosenzweig, 47, was briefly back home Tuesday after evacuating her Ventura house, which has been spared so far while most on her street had burned in the largest and most destructive of the region's fires, the Thomas Fire. She and her husband were about to evacuate again, hoping they would get lucky twice as the new winds arrive. "Heck yeah, I'm still worried," Rosenzweig told the AP. "We're very grateful but I know we're not out of the woods." 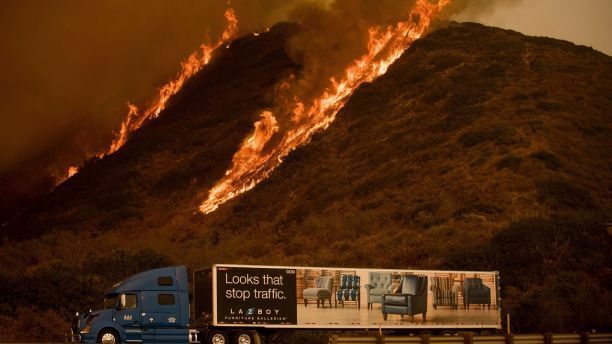 In what may have been an early sign of the 140-square-mile fire getting new life, several thousand new evacuations were ordered late Tuesday night in Ojai, a town of artists and resorts. The 90,000-acre fire had been creeping there already, sweeping through mountain ridges and canyons to the sea, but an increase in winds pushed it close enough for many more to flee. The Thomas Fire has killed more than two dozen horses at a stable and had destroyed at least 150 structures, a number that was expected to get far bigger as firefighters are able to assess losses. "We're basically in an urban firefight in Ventura, where if you can keep that house from burning, you might be able to slow the fire down," said Tim Chavez, a fire behavior specialist. "But that's about it."